You’d think the novelty of nostalgia would have worn off by now, but judging from the ever-crowded parking lot, I reckon not. But then Cracker Barrel combines two of Southern women’s greatest loves: eating and shopping. Also, you can get in quite a bit of gossiping, too, depending on who you run into and how long you have to wait for a table. I’m not going to extol the virtues of Cracker Barrel’s food, because I fail to see any. 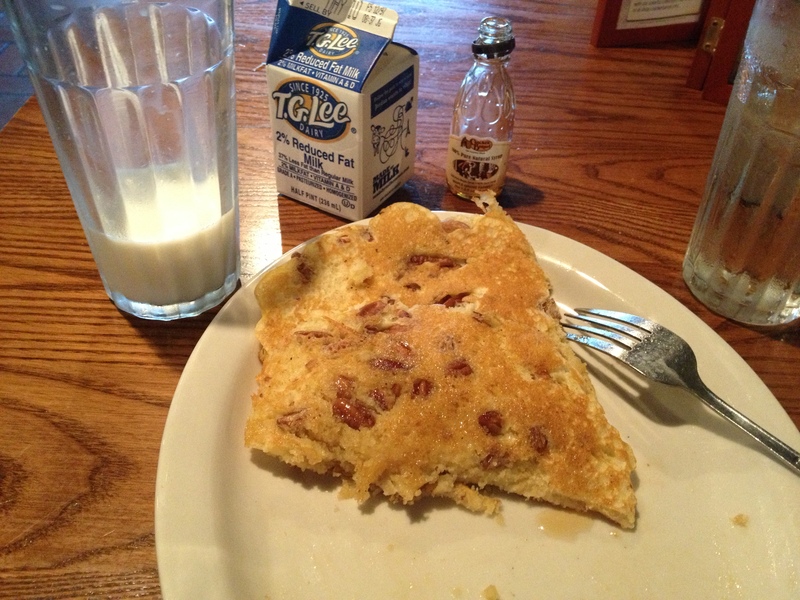 Ok, I’ll admit, they do have some good pecan pancakes that come with wee bottles of maple syrup. I know this because whenever I’d come home to visit, Mom would wake me up WAAAAY early the next day (like around 9:00) to go get some pancakes. What Cracker Barrel lacks in culinary skills, they make up for in kitsch. Where else are you going to find cornbread pans, patriotic clocks, wooden toys, and old-timey candy all in one place? Ok, maybe your grandmother’s house. But the candy will likely be not so much old-timey as just plain old. There’s plenty to look at while you wait, and the fun doesn’t stop after you’re seated. Who’s up for a challenging round of the peg game? You know the one with a triangle-shaped piece of wood featuring pegs filled with golf tees? The object is to “jump” and remove the other tees, leaving only one tee standing. It sounds more exciting than it is. But then, maybe I’m just bitter because I’ve yet to win. I’ve only ever been to Cracker Barrel for breakfast because from what I hear, that’s the only meal worth eating. However, I can’t imagine the food would be any worse than the short-lived “Po Folks” that we used to patronize frequently in college. Because, hey, we WERE po folks, and most anything beats Kraft Macaroni and Cheese. Though I do enjoy poking around in the general store, I haven’t eaten at Cracker Barrel in the last three years. My mom loved those pancakes enough to endure breakfast with a grumpy, jetlagged daughter, and it wouldn’t feel right eating them without her. 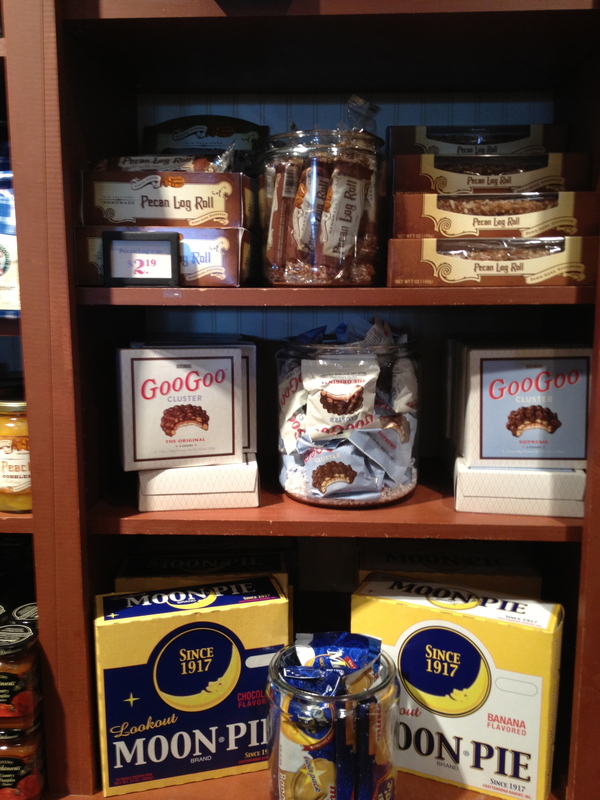 What’s your favorite part of the Cracker Barrel experience? Update: Last year, I went with my sister and dad to have the pecan pancakes again and they did not disappoint. Wish I could say the same about my meal last week. I had the frequently touted chicken and dumplings and they were just sad, y’all. Not as sad as the straight-from-the-can, lukewarm niblets, but almost. Of the fried okra, I will not even speak. In their defense, the biscuit was edible. What puzzles me is that in my infinite quest to find a go-to chicken and dumplings recipe, I keep running across ones that claim to taste “Just Like Cracker Barrel,” as if it were a good thing. Huh? So after a spectacularly underwhelming supper, I decided to go back for breakfast. Thought maybe I could drown the bad memories with a little bottle of maple-esque syrup. Low and behold, it worked. Note: Notions like this hardly ever work, but never underestimate the power of pecan pancakes. Photo credits: Cracker Barrel exterior by Keith Lam, Flickr Creative Commons; pics with bad lighting by yours truly. I love Cracker Barrel’s hash brown casserole. Butter, potatoes, salt – all my favorites! Good biscuits too. Sorry – that comment was from me – Hope at Fairhope Supply. I forgot to leave my name! I guess I was too busy thinking about biscuits! Bwaa Ha Ha Ha!! You crack me up, Hope! Funny you should refer to CB as a “gift shop eatery.” I was trying to get SIRI to help me locate Cracker Barrel restaurant, but she informed me that such a beast didn’t exist and did I want the address for “Cracker Barrel Country Store.” I guess now we know where their priorities lie! I love Cracker Barrel. True story: I live about 5 miles from George Jones’ house. Cracker Barrel was selling George Jones CDs at the time. We were paying up, and a woman behind the counter asked another woman behind the counter: “Hey, if George comes in today, get him to sign some more CDs. We’re about out.” So, apparently, George Jones liked Cracker Barrel, too. Yes, but would GJ approve of those sad chicken and dumplings? Maybe he’s more of a pancake man. My mom and I love Cracker Barrel. My brothers and father tolerate it and will only order from the breakfast menu. I love their maps of the USA that show where all their stores are. I have driven from the South to the West coast and back to the South using the maps as my guide. The first trip was just my mom and I and we stopped at Cracker Barrel each day until we hit the California state line. It was really fun. Also – if you buy a book on cd from their store you can exchange it at another store for a small fee, which can make a long car trip easier. I love CB I often stay behind one in my little RV and have super and then breakfast with them. Sometimes I will travel and hardly eat anywhere else. I never thought about it, but their parking lot would make a convenient camping area! With the added bonus that you wouldn’t have to cook with a kerosene stove! You’re right about the pancakes. I had the worst scrambled eggs in Alabama history there just last month. Wow! Those must have been some disturbing eggs!